Now for the real reason you are all here, the recipe post. 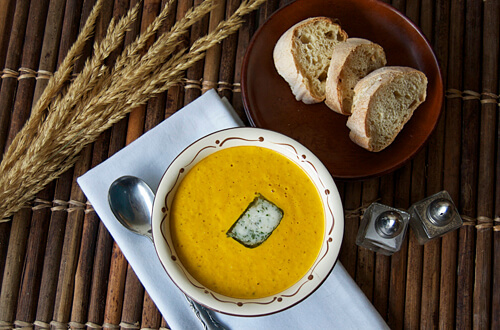 This soup is a classic Escoffier pureed soup recipe. The rice in the soup gives it an out-of-this-world creamy, silky texture. I didn’t think I would be a fan of this soup when I first made it, but ended up loving the sweetness from the carrots; the mint compound butter is a must as well! I have made it multiple times since (and also got 100% on my practical exam for it! ), so I felt the need to share it with you. 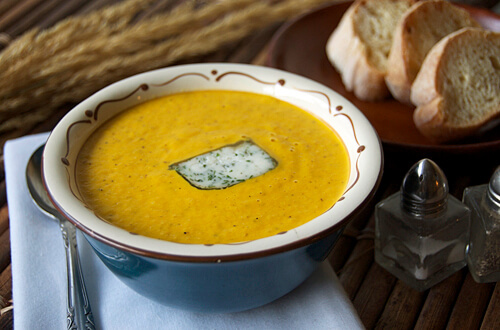 This is a perfect soup for this time of year; carrots are in season and it will warm you up on any cold day! In a large pot, stew the carrots, onion, butter and thyme (5-10 min). Add the chicken stock and rice, bring to a boil, then reduce to a simmer until rice is cooked through. Strain, but reserve the liquid. Blend the solids in batches until smooth, adding the reserved liquid to reach desired consistency. Before serving, make a compound butter by combining 5 oz softened butter with the minced mint. Shape as desired and return to the fridge to solidify. Serve each bowl of soup with a slice of the mint compound butter.